Actually, the title is a bit delayed. This was the view from my room yesterday, when I stayed at a most quaint ryokan (type of hotel) in the small town of Osaka 小坂 (not to be confused with the big city of Ōsaka, 大阪). In case anyone is interested in coming to this area (highly recommended if you can), the ryokan is the Sengakukan, very famous in the region (and for disclosure, I did receive free room and board without any expectations of promoting it, though I’m happy to do so). The fishing was okay. 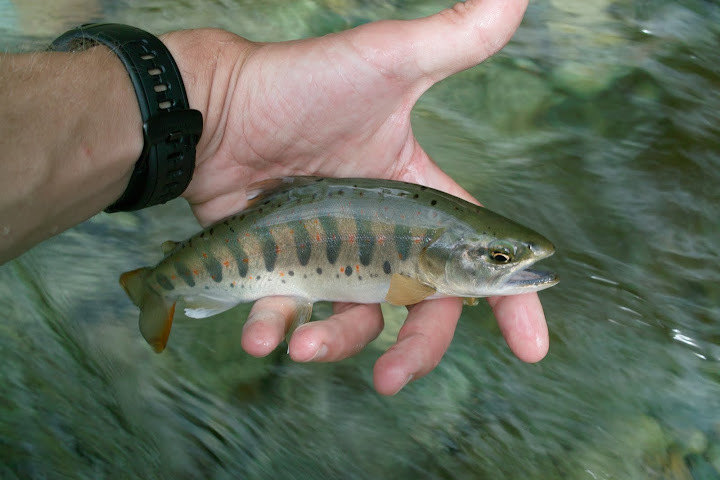 As with most streams in Japan, the number of fish in the rivers was not that large. The fish that do remain in the water are just gorgeous, as they have not been beaten up by bad catch and release practices. Osaka is famous for its waterfalls and “shower climbing” (canyoning through waterfalls and pools). In all, the area is estimated to have over 216 waterfalls, though some people suspect it has even more falls that are hidden deep in the woods. How I cam here was interesting. On Saturday, I met the owner of the ryokan here in Maze. She said her husband really likes fishing, and that I should get to know their town and possibly fish with him. She invited me to come the next day and stay there. What an awesome couple of days those were. The ryokan was right next to a gorgeous river, which you can see on the picture above. The owners of the ryokan took me around town to see the waterfalls (they hiked around in their yukata robes, adding to the feel of “romantic Japan” that many people may have). After hiking to the falls I met two local guides of my age, who volunteer as guides during the weekend. They said they do shower climbing and enjoy fishing. We agreed to fish the yumazume (the evening activity period) together. We were also treated to a 5-star dinner by the owners of the ryokan and were joined by their son who works there and is about my age. 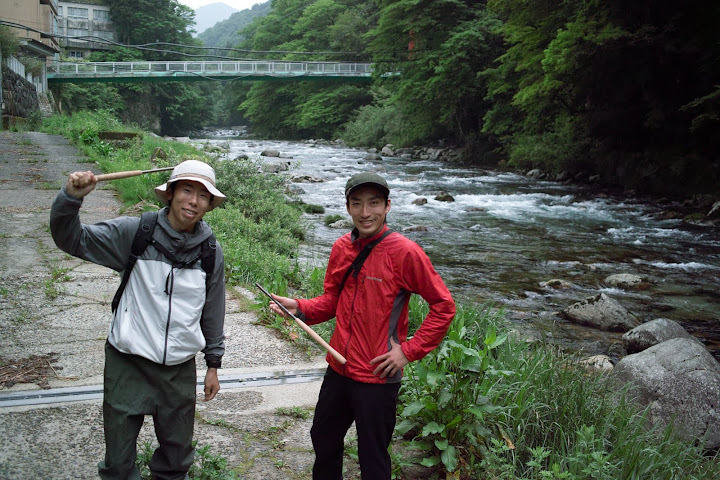 Unfortunately, we couldn’t find dates to go shower climbing/tenkara fishing together before I leave. I have to return next year so we can do the 3-day canyoning trek to Mt. Ontake. The stream behind the ryokan featured a few points where natural spring water bubbled up. The onsen water feeds a fountain inside the hotel where one may drink it – it has a very interesting soda texture to it, but tastes a bit like, well, fart (yes, the sulphuric smell of many onsen water sources). Apparently it’s very good for your health, but I could only must a glass of it. A few dishes are also cooked with that water. Hot onsen water also feeds the outdoor bath of the ryokan. Today I learned that the word onsen is used for both hot and cold spring water, though it’s normally associated with hot water in Japan. I will have to write another post very shortly about the Hoba Sushi Festival over the weekend. It was a surreal event during the evening, as we lit 10,000 candles on the fishing center grounds and lining the banks of the stream next to it to remember the victims of the earthquake and tsunami. Amazing and wondrously beautiful adventures on your journey! Japanese maple outside your window, the cliffside stairway up to the waterfall, and 10,000 candles lighting the river bank at night in remembrance. I’m enjoying your reports immensely. These are experiences of a lifetime. You must be having such a wonderful time over there in Japan. I’m learning so much from what you write of what seems to be a wonderful people and culture. Thanks for sharing your adventure. Many thanks for the comments. It’s indeed quite a dream journey and it really feels like it. It’s amazing how things are just clicking in a way I couldn’t even expect, and definitely not plan for. I’m enjoying every minute of it and already dreading the end of the trip which is only 2 weeks away. The last months went by so incredibly fast. My schedule for the next 2 weeks is packed, so time will fly. Wonderful post Daniel. The type of books I read most often are true tales of travel off the beaten path, places outside the city, tales of experiences outside islands of tourists isolation from the local culture. Books of the type published by Traveler’s Tales and similar publishers. I have read several books about Japan: A Year in Japan, Japan-true stories of life on the road, The Roads to Sata – a 2000 mile walk through Japan, and Lost Japan. Misplaced somewhere in my house, and not yet read, is Unbeaten Tracks in Japan – by Isabella L Bird, about her experiences in 1878 Japan. And a few other similar books. Your encounters described here are my kind of story. Connections to the local people and culture you can not obtain while staying at the local Hyatt Shibuya Holiday Palace Express Hotel. Thanks for telling the tale. Thank you David, for the encouraging comment. It’s hard to describe so many experiences, I wish I could write more, and your comment is the type that makes me want to do it. I’ll relate what I can. Daniel, struck by your comment about fish being damaged by bad catch and release practices. Many people read your writing and if you were to refer readers to catch and release guidelines and mention them from time to time it would have an impact. That looks like a gorgeous ryokan – very jealous! A great post Daniel, your description of the country is wonderful. I have been following the development of Tenkara USA and your words have made me want to try out this ancient form of fishing. So very simple and back to basics. I have been a traditional fly fisher for 35 years. A sublime culture and people, the descriptions of your journey and your experiences are inspirational. Thank you. WOW!! Daniel, David is right, you need to turn this into a book. Your narrative with the pictures brings us all there with you. The Hoba Sushi Festival pictures are breathtaking. I’ve never seen anything like that. This is a beautiful accounting of a beautiful adventure.